Baron Karza has almost won, but can the Micronauts turn the tide with the help of the Transformers? Membros has been confronted by the angry Micronauts in his own torture chamber, and they want their question's answered; Oz and Phen make thinly-veiled threats, but Membros is happy to answer, taking a sadistic pleasure in informing them that their comrade Acroyear has been reconditioned into a loyal soldier for Baron Karza. When Oz inquires into where they are, the interrogator reveals that they are on a Ministry of War prison orbiting Earth; and, further, it has a section for "big" prisoners as well as small: not the Earth giants, as Phen assumes, but the towering Transformers! The interrogation is interrupted by Larissa, who enters the room to inform Oz that Biotron has accessed the prison computers, discovering that Membros was telling the truth about Acroyear; however, the robot also has good news, having found the prison of the Transformers that aided them when the Micronauts first arrived on Earth and dispatched Microtron and the Trons to free them... and that's not all, as he has also found the Sharkos, the ship responsible for destroying the Heliopolis! Formulating a plan, Oz gets Biotron to have Microtron meet the rest of the team at the Sharkos. On Earth, Baron Karza meets with Commander Raith, leader of his Acroyear forces. The Commander informs Karza that the Micronauts' Acroyear has been reconditioned and assigned to an Acroyear III squad and that the rest of the team is undergoing interrogation by Membros, but raises his concern that the Earthwar could be won far faster if they committed all of their forces to the fight; Karza explains that an army must always have reinforcements ready to assist if needed, before inviting Raith to use his marksmanship skills against the Earth forces. As Raith mans the Mobile Operations Base's artillery, Karza raises the question of where his wife Shazraella is... which, as it transpires, is within the base, speaking to a Time Traveler! As she works on a suit of armor, the cosmic being offers her information and aid to further her own goals; but, as she warns the Time Traveler, if it leads her astray, her wrath will be terrible to behold. On board the Sharkos, the ship's crew — Antron, Lobros, Kronos and Centaurus — are engaged in an argument over a game of mendaki. Membros soon enters, accompanied by what Centaurus assumes one of his torture devices; but it is actually the murderous Micronaut robot Omegatron, which sets to work slaughtering the crew as Membros makes his exit! The Tron manages to defeat all but Centarus, which shoots it point-blank in the cranial unit, but the centauroid soldier is itself taken out by a blast from Larissa. Though Membros has escaped, the Micronauts have captured the Sharkos, and pilot it to the Ministry's base on Earth. They are shot down by Raith when Karza realises something is wrong, but the crew — Micronaut and Tron alike — survive to confront the Baron. Karza enerchanges into his centaur form in order to fight the team, but Oz is saved from his hand-missile by a force field projected by Larissa; despite her intervention, Karza seems to have the upper hand, until the Micronauts' reinforcements arrive in the form of the Autobots Optimus Prime, Jazz, and Arcee! Though the tide is turned by the Transformers' intervention, Karza is unimpressed, and summons his own reinforcements in the form of an enormous swarm of Acroyears III, too many for the Autobots to cope with. 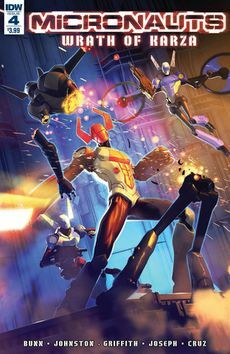 To add insult to injury, the Baron presents Oz with his newest soldier, the Micronauts' Acroyear, reconditioned to serve him... but it seems that the brainwashing has not taken — not only is Acroyear still loyal to the Micronauts, but Karza's army of robotic Acroyears now follow him instead! While Karza did not see the betrayal coming, he still has tricks up his sleeve — with a switch on his arm, he deactivates the now-rogue Acroyears rather than allowing them to be usurped from his control, and reclaims his fist from Larissa's forcefield. Though the Micronauts no longer have their Acroyear army, Oz is still confident that Karza has to concede, being alone and without advantage after Acroyear pulls Raith from the Ministry ship. But Karza is never alone... for Shazraella, now clad in armor reminiscent of Karza's and wreathed in energy like the powerful Time Travelers, has arrived to stand with her husband! Baron Karza first used his hand-launching power in issue #3; it was established as being thanks to his Enerchange abilities in his Hasbro Heroes Sourcebook profile. Karza makes no response to seeing Larissa alive, despite being crushed by her apparent death back in issue #2. Originally solicited for release in July, this issue arrives a month late in the middle of August, continuing IDW's series of ongoing delays. Yes, Acroyear overcoming the reconditioning and taking control of the Acroyear III army comes completely out of nowhere. You're not missing anything; it just... happens, with no buildup or explanation. Regular cover: Acroyear vs a swarm of Acroyears III, by Alex Ronald. Subscription cover: Baron Karza, by Tom Whalen; part of IDW's July series of Tom Whalen covers. Retailer incentive cover: Baron Karza triumphant, by Andrew Griffith and Thomas Deer. "The Hasbro Tribune" editorial page promoting July's Hasbro Universe titles, including G.I. Joe #8, Hasbro Heroes Sourcebook #3, M.A.S.K. : Mobile Armored Strike Kommand #9, this issue, Optimus Prime #9, Revolutionaries #8, ROM #13, Rom vs. Transformers: Shining Armor #1, Lost Light #8, and Till All Are One #12.